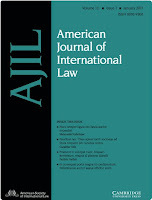 The American Journal of International Law (AJIL) has been published quarterly since 1907. It features articles, editorials, notes, and comments by pre-eminent scholars on developments in international law and international relations. The Journal contains summaries and analyses of decisions by national and international courts and arbitral or other tribunals, and of contemporary U.S. practice in international law. Each issue lists recent publications in English and other languages, many of which are reviewed in depth. The Journal is indispensable for all professionals working in international law, economics, trade, and foreign affairs. Non-members may join the Society or purchase a subscription through Cambridge University Press. The Journal ranks as the most-cited international law journal on Google Scholar. It is also considered by the nonprofit, scholarly periodical resource JSTOR to be "the premier English-language scholarly journal in its field." Since its founding in 1906, the American Society of International Law (ASIL) has been the pre-eminent scholarly society in the international law field. For more than a century, its publications, conferences, and research and educational programs have advanced the study and use of international law as a cornerstone of a just and peaceful world. The Society was a product of the American peace movement of the late 19th Century and the conviction of a number of leading international lawyers that international disputes should be resolved through formal dispute settlement mechanisms rather than war. Starting in 1895, members of the American foreign policy establishment began meeting annually at Lake Mohonk in upstate New York to discuss these ideas, and at the 11th Mohonk conference in 1905, the idea of a permanent society and journal of international law was born. A committee was established to develop the concept, and at a meeting on January 12, 1906, in the offices of the Bar Association of the City of New York, the Constitution of the American Society of International Law was formally adopted. 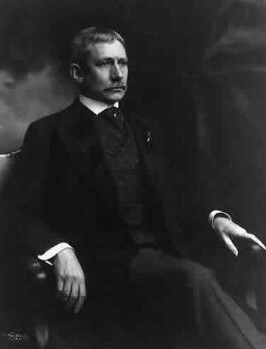 U.S. Secretary of State Elihu Root was the first and longest-serving president of the American Society of International Law, holding the post from 1906 to 1924. He was succeeded as president by then-U.S. Secretary of State and later Supreme Court Chief Justice Charles Evans Hughes. James Brown Scott, solicitor of the Department of State under Root, managed the day-to-day affairs of the Society in its early years and served as its third president, from 1929 to 1939. In its early years, the Society’s Annual Meeting regularly included a gathering at the White House and featured addresses by the U.S. president. Throughout its history, the ASIL Annual Meeting has featured significant addresses by leading jurists and statesmen from throughout the world. 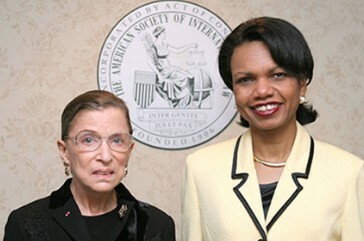 In 2006, the Society published A Decent Respect to the Opinions of Mankind, a collection of speeches by U.S. Supreme Court justices to the Society in its first century. As the range of issues and actors in the international legal field has expanded, in recent years the Society’s meetings have featured addresses by judges and senior officials from a host of international courts and tribunals, justices of foreign supreme courts as well as those of the United States, a United Nations secretary-general (Ban Ki-Moon), Nobel-prize-winning economists, civil society leaders and activists, and the leading scholars and practitioners in the field. Along with the Annual Meeting, the Society’s publications have been the foundation of its contribution to the international law field. 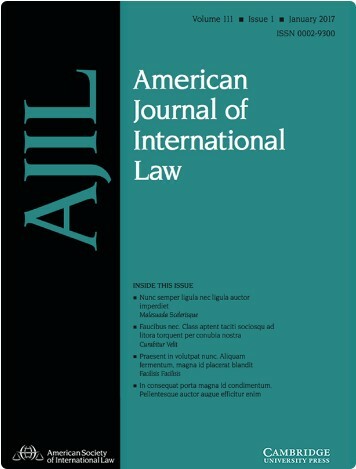 Published since the Society’s founding, the American Journal of International of Law is widely considered the pre-eminent scholarly journal in the field. Its pages have included seminal articles on all facets of public international law for more than a century. To mark the Society’s centennial, the Journal Board of Editors published a series of essays surveying the field and the Journal’s contribution during the 20th Century. These essays are also separately collected in a single volume, A Century of International Law, published by the Society. The Society’s Annual Meeting Proceedings have also been published since its founding, and since 1962 its International Legal Materials has been the go-to source for primary documents in the field. In 1959, ASIL acquired a permanent home when Genevieve Tillar, widow of Benjamin Johnston Tillar, gave her stately residence on Sheridan Circle, the heart of Washington’s Embassy Row, to the Society for use as its headquarters. Then ASIL President Charles Martin presided at the dedication of Tillar House on April 28, 1961. The ceremony included speeches by the Honorable John J. McCloy and Professor Myers S. McDougal, the participation of descendants of four Society founders, and the reading of a letter sent by then President John F. Kennedy. With a permanent home at Tillar House, came the Society’s first-ever full-time executive director, H.C.L. Merillat, and the establishment of the Society’s library, today, the deFord Library, home to more than 20,000 volumes. The stately mansion quickly became a one-of-a-kind venue for public events and educational programming for the international law community. In the late 1990s, the Society leadership determined that Tillar House was an asset not only worth keeping but also worth improving. A capital campaign, led by Judge Charles N. Brower, successfully raised $2 million to dramatically remodel the house, creating much improved meeting and research space for the public and work-space for the ASIL staff. The renovated Tillar House was rededicated in November 2002, with a distinguished panel on terrorism, followed by a reception for campaign and ASIL leaders, including the presence of U.S. Supreme Court Justice Sandra Day O’Connor and prestigious honors to Judge Brower, Judge Stephen Schwebel, James Carter, William D. Rogers, and Rita E. Hauser. In the same way that a letter from President Kennedy had been read to the assembled guests at Tillar House’s dedication in April 1961, a letter from President George W. Bush was read on the occasion of Tillar House’s rededication. The Society celebrated its centennial in 2006 with its largest ever Annual Meeting and celebration dinners in New York and Washington, DC, to launch the Society’s second century. Today, the Society continues to engage and inform the international law community through its publications and meetings. Its newly renovated Tillar House is a regular meeting place for debate and discussion of cutting-edge issues in international law; the Annual Meeting remains the must-go international law conference of the year; and Society publications are essential reading in the field.